Question for 2019 and beyond: What is the significance and value of a world-class AI (artificial intelligence) platform that is profitable and generates positive free cashflow (FCF)? When Google fought off Facebook to acquire DeepMind, the British AI lab behind deep learning algorithm AlphaGo which defeated the world champion in the complex ancient strategy game Go, for £400m (then around US$600m) in 2014, not everyone at Google saw it as a smart move. In the first year after Google’s acquisition, DeepMind had no revenue. Four years later, DeepMind achieved revenue of £54.4m (US$69m), mostly from projects with its parent Google, and its heavy losses accelerated to £281.9m (US$357m), according to records filed at the UK’s Companies House, although Google’s data centers have taken advantage of DeepMind’s technology to produce cost savings. According to engineers swept up in a major round of layoffs within IBM’s Watson division in May 2018, the company’s promotions of its “cognitive computing” platform mask its own real difficulties in turning its AI into a profitable business, with clients such as M.D. Anderson, one of the world’s top cancer research institutions, shutting down the Watson AI project after spending more than $62m over four years. IBM’s Watson is the first commercially available AI platform that can interact in natural language, process vast amounts of big data and learn from interactions with people and systems, and it is integrated with the company’s cognitive-solutions business. Since Jeffries’ scathing equity research report in July 2017 on Watson that “it seems unlikely to us under almost any scenario that Watson will generate meaningful earnings results” because of the complexity of its services component and the cost of using it, IBM share price has fallen 26% while NASDAQ rose 5% over the same period. So both Google DeepMind and IBM Watson, two of the world’s foremost AI platforms who have triumphed over chess champions, are finding profitability a challenge. In Asia, there is another rare and listed world-class AI platform with its deep learning technology that not only trounced the grandmaster titleholder Amahiko Sato in shogi, the ancient Japanese chess, but is also highly profitable with EBIT margin of 30.7% (1H10/2019 margin 35.4%), positive FCF margin of 29.9%, and ROE (= EBIT/ Equity) of 23.5%, and has a healthy balance sheet with zero debt and net cash of 1.475bn yen (US$13.3m). Chess enthusiasts would know that shogi is more complex because pieces return to the board after being captured, increasing the number of move permutations that must be considered. Shogi is played on a 9×9 grid with an average game length of 110 moves, and chess on a 8×8 grid with an average game length of 80 moves. There are about 10^120 possible moves in chess, compared to 10^220 for shogi. Shogi players are very respected in Japan. Japan’s reverence for shogi dates back to the Heian period (794 to 1185), when it was played by monks and samurai alike, and was a symbol of intelligence that was also loved by commoners. Top professional shogi players are also rewarded well. The legendary 48-year-old grandmaster Yoshiharu Habu, the only person to simultaneously hold seven major professional shogi titles at the same time and was defeated by grandmaster titleholder Amahiko Sato who went on to qualify for the memorable face-off with HEROZ AI, is reported to have earned over US$24m in tournament winnings and game fees (1993-2017) over his career. This week, we highlight the Asian exponential innovator HEROZ (TSE: 4382), founded during the 2008-09 crisis in April 2009 by Takahira Hayashi who was a former world amateur champion in shogi at the age of 23. 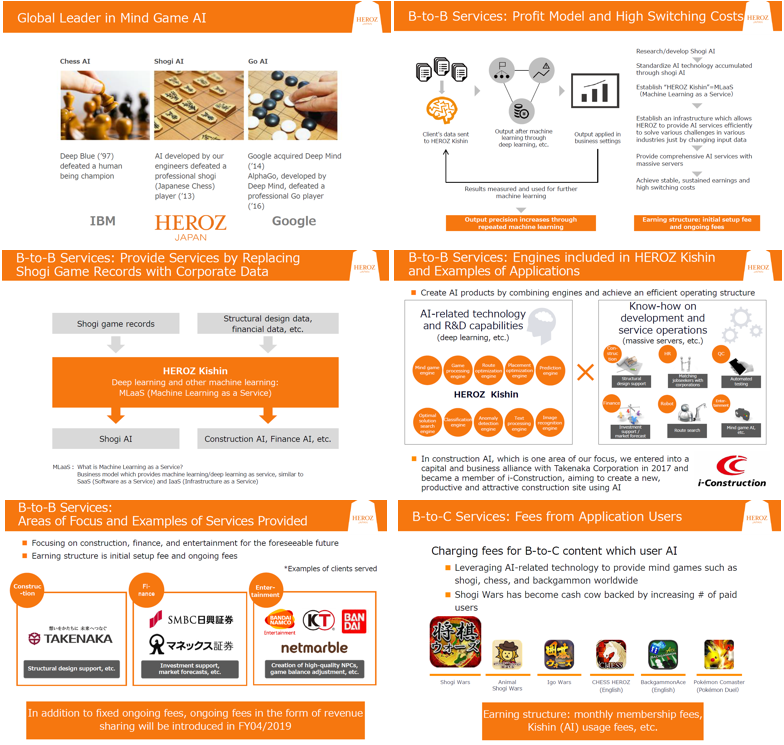 HEROZ MLaaS (Machine Learning-as-a-Service) B2B business model enables the generation of stable, sustained earnings, serving clients such as BANDAI NAMCO Entertainment (TSE: 7832), The Pokémon Company, Hearts United Group/Digital Hearts (TSE: 3676), Nomura Securities, Daiwa SMBC, Nikko Securities, Monex (TSE: 8698), Honda Motor, Takenaka Corporation (one of the largest architecture, engineering and construction firms in Japan) etc. HEROZ B2C games business generates monthly membership fees and AI usage fees. HEROZ flagship game Shogi Wars is free up to three games a day, and members pay 600 yen a month for unlimited games. The popular ‘summon shogun’ AI service is 120 yen a month for 5 hands. The number of downloads of the Shogi Wars app exceeded 4.9 million as compared to the estimated domestic shogi population of about 10 million adults and children. Shogi Wars is also an official application of the Japanese Shogi Federation and players can get an official diploma at the stage level in the app. We think HEROZ is also a potential takeover candidate by giants like Microsoft which has made five AI acquisitions in 2018 alone. As highlighted last week, market positions are not redistributed during sunny and calm times, but during times of crisis. The specialization and innovative force of H.E.R.O. Innovators makes them indispensable for their customers and they have stood the test of time in facing crises, proving themselves to be adept consolidators in snatching market share from unfocused rivals to achieve market leadership and create new categories of growth. High-quality exponential innovators are also the strongest and fastest rebounders to emerge from gloomy crisis episodes, while “defensives”, dividend-type companies, and seemingly cheap bargains become increasingly disrupted to become cheap-gets-cheaper value traps with Asian-style misgovernance and accounting tunneling fraud risks when times get tougher. Trade war and regulatory risks still linger on with the passing of the tumultuous year of 2018, which marks the 10th anniversary of the 2008-09 crisis. What lies ahead in 2019, or the next decade 2019-2028, especially as overall economic and corporate earnings growth across industries slow down substantially? Thus far, of the 54 entrepreneurs and CEOs whom we had highlighted in our weekly research brief HeartWare, 25 are in our focused portfolio of 46 HERO Innovators while the rest are in our broader watchlist of 200+ stocks. YTD 2018 returns (Jan-Dec 2018) of our actionable model portfolio of 46 HERO Innovators (equal-weighted) are +22.2%; returns backtested since Mar 2013 are 527.1% (CAGR 38.2%). These exponential innovators are doubling their core earnings over a three-year period based upon a powerful business model with exponential edge; our model portfolio of 48 HERO Innovators have achieved a weighted absolute growth in operating profit of 144% over the recent three years with weighted margin of 21.3%, weighted ROE of 31.2%, weighted ROA of 21.1%, and a healthy balance sheet with weighted net cash as a percentage of market cap of 6.5%. Weighted portfolio EV/EBIT and EV/EBITDA of our HERO exponential innovators stand at 31.2x and 27.7x respectively. A stock with seemingly cheap valuation of say Price-Earnings (PE) ratio of 5x is risky when it has a highly levered balance sheet and its ROE is 1%, or a “fundamental PEG ratio” of 5x (= Valuation as measured by EV/EBIT divided by Quality as proxied by ROE = = 5x/1%). A stock with valuation of say EV/EBIT 30x with ROE of 30%, or a fundamental PEG ratio of 1x (= 30x/30%), can be considered to have relatively more resilient valuation with potentially higher upside. 13% of our H.E.R.O. portfolio companies are selling “products”, such as Koh Young Technology (KOSDAQ: 048460) who is the global market leader in 3D AI test inspection system and software; 10% are ecommerce companies such as MonotaRO (TSE: 3064) who is Japan’s largest B2B ecommerce platform in MRO (maintenance, repair and operations) items; while the majority 77% are “software, information and data” companies (with zero exposure to “ad-tech” companies), a group which we believe is highly impervious to trade war risks. As an addendum to the valuation of exponential innovators, we had a conversation with a fellow fund manager who commented on Salesforce.com’s (NYSE: CRM) Price-Earnings ratio of 143x. While Salesforce.com reported that its latest 12-month accounting earnings (as at Oct 2018) is US$721.5m, its SaaS (Software-as-a-Service) business model generates recurring predictable revenue streams and a positive free cashflow of US$2.55bn that has grown 40-50% yoy with a “ROE” of 17.4%. Using the valuation path of exponential innovators framework that we developed based on the empirical observations of the multibaggers over the past three decades and applying it to Salesforce.com, a reasonable fundamental PEG ratio for a Stage IV Built-to-Last mega-cap innovator like Salesforce.com is 2-2.5x. Applying a fundamental PEG ratio of 2-2.5x to Salesforce.com’s positive free cashflow of US$3.3-3.5bn (growth of 30-40%) indicates that a valuation multiple of 34.7-43.4x, yielding a market value range of US$115-144bn vs its current market value of US$103bn, thus serving as a rough guide on the valuation path of exponential innovators. In his deeply profound book Falling Upward, Franciscan monk and author Richard Rohr talks about the first and second halves of our life. In the first half of life, we are mostly building a strong “container” or our identity, “looking good” to ourselves and others; the second is to find the contents that the containers was meant to hold. In the second half of life though, we start to ask deeper questions as we embark on a “further journey”, one that involves challenges, broader horizons and “necessary suffering” that shocks us out of our prior comfort zone. Eventually, we need to see ourselves in a different and more life-giving way. Life is made up of many failings and fallings, amidst all of our hopeful growing and achieving. Rohr offers a new paradigm for understanding one of the most profound of life’s mysteries: how our failings can be the foundation for our ongoing growth, the stepping stone to the joys that our second half of life has in store for us. One of the best-kept secrets, and yet one hidden in plain sight, is that “falling down” is in fact moving upward. Those who have gone “down” are the only ones who understand “up”. H.E.R.O. (Honorable. Exponential. Resilient. Organization) is a culmination of the learnings from my many mistakes in which I was “falling down” in the “overall” value trap – the Value 2.0 portfolio of investing in decent quality businesses with a certain competitive advantage (and some weaknesses & risks) run by hardworking entrepreneurs and have reasonably cheap valuations and so, based on an “overall” weighing of the strengths and weaknesses, while they do not have an “exponential edge” in their business model quality, they should be good investments over time with mean reversion in valuation working in favor. But these Value 2.0 stocks turn out to be the “new” group of cheap-gets-cheaper value traps in an exponential world where there is a structural break in data in the market’s multi-year appraisal (as opposed to “mean reversion” in valuation over a time period of 2-5 years) on the type of business models, the “exponential innovators”, that can survive, compete and thrive in this challenging exponential world we now live in. In short, disruptive innovation forces sweeping across industries create ever more “value trap” losers and a selected under-the-radar group of winners. We think the implication for investors in one of the largest ever business model shifts in this “further journey” into “Value 3.0” is that a distinctive and alternative investment strategy to capture long-term investment returns created by disruptive forces and innovation without herding or crowding to invest in the highly popular megacap tech stocks or risking to chase richly-valued loss-making cash-burning tech start-ups, and also provide capital allocation benefit to investors in building optionality in their overall investment portfolio, is ever more critical. While tech-focused innovators with non-linear exponential growth potential are the most relevant multi-year investment trend and opportunity, it is important to have the fortitude to not chase after the popular shiny things and overpay for growth and the Rosetta stone lies in understanding and deciphering the business model dynamics of exponential innovators. Starting 2 January 2019, we will be moving from our Robinson Point office to 182 Cecil Street, Level 17 of the Frasers Tower building where Microsoft is one of the anchor tenants. Frasers Tower is located between the Bangkok Bank building and the Telok Ayer Chinese Methodist Church and is near the Amoy Street hawker food center. We welcome you to visit us over a warm cup of afternoon coffee at our new office on any day. Our emotional labor of love over the past months in sharing openly our research ideas (to battle-test our ideas by critiques and avoid blindspots in investing) and setting up the proper regulated UCITS fund structure to protect investors’ interests has deepened our conviction for the positive change that we will make together with H.E.R.O. – and we are getting closer to giving birth in end January/February 2019 to H.E.R.O., the only Asia SMID-cap tech-focused fund in the industry and guarding investors’ interests in the regulated UCITS fund structure with daily NAV & daily liquidity and no exit fees. There is something profound in shogi culture’s emphasis on seizensetsu, or the belief that humans are fundamentally good. A journey into the second half of our lives awaits us all. A “further journey” is a well-kept secret. Not everybody goes there. Many people do not even know there is one. There are too few who are aware of it, tell us about it, or know that it is different from the journey of the first half of life. If you identify yourself in the values and bigger sense of purpose in H.E.R.O., or you wish to tell from your heart to your most important person, son, daughter, wife, husband, or best friend that you are a farsighted and thoughtful explorer in the H.E.R.O.’s Journey participating in the long-term exponential growth of a selected group of outstanding entrepreneurs, standing up for the embracement of the human spirit, please contact us via email or WhatsApp at +65 9695 1860. Thank you very much for your patience and support and we look forward to growing exponentially with you as we explore the H.E.R.O.’s Journey together. We wish you and your loved ones a fulfilling and healthy New Year 2019 ahead. “Since May 2017 when our Shogi AI PONANZA won the grandmaster titleholder Amahiko Sato, who had ousted the legendary triple-crown master Yoshiharu Habu to qualify for the memorable face-off with PONANZA, many wanted to collaborate with HEROZ. There are many companies that not only want to improve work efficiency at AI, but also want to collaborate in projects and fields that have impacts that can change the industry,” said HEROZ CEO Takahira Hayashi thoughtfully. HEROZ, Inc. (TSE: 4382) is “Japan’s DeepMind” AI platform & SaaS innovator which develops AI engines for its B2C business to develop various intellectual games for smartphones worldwide, such as Shogi Wars, CHESS HEROZ, and BackgammonAce and for its B2B business to solve difficult problems in a wide range of industries such as the construction industry to better design buildings, the financial services industry, gaming industry in software testing, etc. Clients include Nomura Securities, Daiwa SMBC, Nikko Securities, Monex (TSE: 8698), Honda Motor, Takenaka Corporation (one of the largest architecture, engineering and construction firms in Japan), The Pokémon Company, BANDAI NAMCO Entertainment (TSE: 7832), Hearts United Group/Digital Hearts (TSE: 3676). HEROZ AI deep learning engine was also the first to defeat a professional player in Shogi, also known as Japanese chess, in 2013, including trouncing the grandmaster titleholder Amahiko Sato in May 2017. HEROZ co-founder Takahira Hayashi was a former world amateur champion in Shogi at the age of 23. HEROZ MLaaS (Machine Learning-as-a-Service) B2B business model establishes an infrastructure which allows HEROZ to provide comprehensive AI services efficiently to solve various challenges in various industries just by changing input data, while achieving stable, sustained earnings with initial setup fee and recurring ongoing fees and high switching costs since output precision increases through repeated machine learning. Client’s input data are sent to HEROZ AI Kishin engine and the output generated after machine learning through deep learning are applied in business settings. Results are measured and used for further machine learning. In addition to fixed recurring ongoing fees, ongoing fees in the form of revenue sharing will be introduced in FY04/2019. HEROZ B2C games business generates monthly membership fees and AI usage fees. HEROZ flagship game Shogi wars is free up to three games a day, and members pay 600 yen a month for unlimited games. The popular ‘summon shogun’ AI service is 120 yen a month for 5 hands. The number of downloads of the Shogi Wars app exceeded 4.9 million as compared to the estimated domestic shogi population of about 10 million adults and children. Shogi Wars is also an official application of the Japanese Shogi Federation and players can get an official diploma at the stage level in the app. HEROZ’s overall marginal profit ratio, defined as ‘(net sales –app commission fees –royalties)/net sales’, improves as the composition of AI B2B services increases. HEROZ marginal profit ratio has increased from 67.6% in FY04/2017 to 76.3% in FY04/2018 and 83.4% in 1H10/2019. With the compellingness and circumspection exponential edge, HEROZ’s SaaS business model generates stable and recurring monthly revenue, achieving a 32% and 299% yoy increase in sales and operating profit respectively in FY04/2018 with EBIT margin of 30.7% (1H10/2019 margin 35.4%), positive free cashflow margin of 29.9%, and ROE (= EBIT/ Equity) of 23.5%, propelling a 216% increase in market value since its listing on 18 May 2018 at the IPO price of 4,500 yen (split-adjusted price of 2,250) to US$442m. On 7 Dec 2018, HEROZ announced its 2Q2018 results (May – Oct 2018) and 1H sales of 646m yen, operating profit 229m yen, and expects FY2019 sales to increase 12.6% to 1.3bn yen and operating profit to increase 13% to 400m yen. Balance sheet is healthy with zero debt and net cash of 1.475bn yen (775m yen in cash raised from IPO), or 2.9% of market value. HEROZ was co-founded by Takahira Hayashi and Tomohiro Takahashi in April 2009 who each own 36.542%, or a combined total of 73.084%. Strategic shareholders include KDDI 2.923%, Bandai Namco (TSE: 7832), Koei Tecmo (TSE: 3635) 1.291%, Digital Hearts (TSE: 3676) 1.291%, Netmarble (KOSDAQ: 251270) 1.289%, Takenaka Corp 1.192%. (1) Testing inspection in which we learn the test object, read the features, generate test cases, comprehensively test and detect problems and abnormalities. We will learn image data of non-defective / defective products of products and make inspection work more efficient. (2) Automatic monitoring / abnormality detection in which we will learn time series data such as access logs and predict future trends. The threshold is automatically set for the target item, and abnormality detection is done in real time. (3) Demand forecast in which we analyze trends from a wide variety of product information and sales performance and automatically predict future demand. HEROZ team of AI engineers are also well aware of the potential breakthrough research development by Google DeepMind in an article published in the journal Science on 7 Dec 2018 about AlphaZero, a dramatically new version of its AlphaGo. With no prior knowledge or data input beyond the basic rules of the game, AlphaZero taught itself to play not only Go, but also chess and shogi. By playing against itself millions of times and updating its neural network as it learned from its mistakes, in a matter of only four hours, AlphaZero defeated supposedly the best existing game-playing computer programs such as world computer chess champion Stockfish. And in a distinctive, unorthodox, yet creative and dynamic playing style. Strikingly, by comparing Monte Carlo tree searches (MCTS), AlphaZero examines only 80 thousand positions a second, compared to 70 million for Stockfish. AlphaZero compensates for the lower number of evaluations by combining its self-play trained deep learning or deep neural network (DNN) with MCTS to focus much more selectively on the “most promising” variation, rather than to explore exhaustively. It was “wiser”, knowing what to think about and what to ignore. In the published paper, DeepMind addressed many of the criticisms, especially that of AlphaZero winning because of its advanced hardware advantage. While AlphaZero only trained for four hours, the four hours of training was done on Google’s most advanced hardware: its prized Tensor Processing Units (or TPUs) which are at least 100x as fast as the highest-end GPUs, and thousands of times faster than the hardware available 2 or 5 years ago. Thus, it might have been impossible to create AlphaZero before 2017 – the technology just wasn’t there. Does the development in AlphaZero suggest the disruption of AI players? We think it is too early to tell. To create intelligent systems capable of solving a wide range of real-world problems, we need them to be flexible and generalize to new situations. DeepMind admitted that the key weakness of the DNN-guided MCTS “random” searches for the “most promising” moves is that if surprised with a slightly modified set of rules mid-game, AlphaZero might get flummoxed. Interestingly, we noted that 15-year-old professional shogi prodigy Sota Fujii exhibited a counter-intuitive and abnormally aggressive playing style to set an all-time record of 29 consecutive victories. Asahi Shimbun pointed out that Fujii’s playing style changed and improved after he was introduced to HEROZ AI just before turning pro in 2016. With the AI training, Fujii achieved victory with fewer moves by abandoning the conventional strategy of building a defense before going on the offensive. Intrigued and want to read more? Download this week’s H.E.R.O. HeartWare: Weekly Asia Tech News with brief highlights of the inspiring entrepreneurial stories of tech leaders in Asia whom we have been monitoring over the past decade in our broader watchlist of over 300 listed Asian tech companies and our focused portfolio of 40 HERO Innovators who reveal their problems and successes behind building the company. Inspired by Brandon Stanton’s photo-journalistic project Humans of New York which collects and highlights the street portraits and moving stories of people on the streets around us who were doing things that changed lives and made a difference in the city but often went unnoticed, we have curated a collection of Hear the Heart of the H.E.R.O. stories on our website which we aim to update with refreshing and uplifting new stories weekly. Please check them out and give us your valuable feedback so that we can improve to make them better for you. It started with rethinking a few questions. Question No. 1: Can the megacap tech elephants still dance? Or is this the better question: Is there an alternative and better way to capture long-term investment returns created by disruptive forces and innovation without chasing the highly popular megacap tech stocks, or falling for the “Next-Big-Thing” trap in overpaying for “growth”, or investing in the fads, me-too imitators, or even in seemingly cutting-edge technologies without the ability to monetize and generate recurring revenue with a sustainable and scalable business model? How can we distinguish between the true innovators and the swarming imitators? Question No. 2: What if the “non-disruptive” group of reasonably decent quality companies with seemingly “cheap” valuations, a fertile hunting ground of value investors, all need to have their longer-term profitability and balance sheet asset value to be “reset” by deducting a substantial amount of deferred innovation-related expenses and investments every year, given that they are persistently behind the innovation cycle against the disruptors, just to stay “relevant” to survive and compete? Let’s say this invisible expense and deferred liability in the balance sheet that need to be charged amount to 20 to 30% of the revenue (or likely more), its inexactitude is hidden; its wildness lurks and lies in wait. Would you still think that they are still “cheap” in valuation? Consider the déjà vu case of Kmart vs Walmart in 2000s and now Walmart vs Amazon. It is easy to forget that Kmart spent US$2 billion in 2000/01 in IT and uses the same supplier as Walmart – IBM. The tangible assets and investments are there in the balance sheet and valuations are “cheap”. Yet Kmart failed to replicate to compound value the way it did for Walmart. Now Walmart is investing billions to “catch up” and stay relevant. Key word is “relevancy” to garner valuation. We now live in an exponential world, and as the Baupost chief and super value investor Seth Klarman warns, disruption is accelerating “exponentially” and value investing has evolved. The paradigm shift to avoid the cheap-gets-cheaper “value traps”, to keep staying curious & humble, and to keep learning & adapting, has never been more critical for value investors. We believe there is a structural break in data in the market’s multi-year appraisal (as opposed to “mean reversion” in valuation over a time period of 2-5 years) on the type of business models, the “exponential innovators”, that can survive, compete and thrive in this challenging exponential world we now live in. Tech-focused innovators with non-linear exponential growth potential are the most relevant multi-year investment trend and opportunity. During our value investing journey in the Asian capital jungles over the decade plus, we have observed that many entrepreneurs were successful at the beginning in growing their companies to a certain size, then growth seems to suddenly stall or even reverse, and they become misguided or even corrupted along the way in what they want out of their business and life, which led to a deteriorating tailspin, defeating the buy-and-hold strategy and giving currency to the practice of trading-in-and-out of stocks. On the other hand, there exists an exclusive, under-the-radar, group of innovators who are exceptional market leaders in their respective fields with unique scalable business models run by high-integrity, honorable and far-sighted entrepreneurs with a higher purpose in solving high-value problems for their customers and society whom we call H.E.R.O. – “Honorable. Exponential. Resilient. 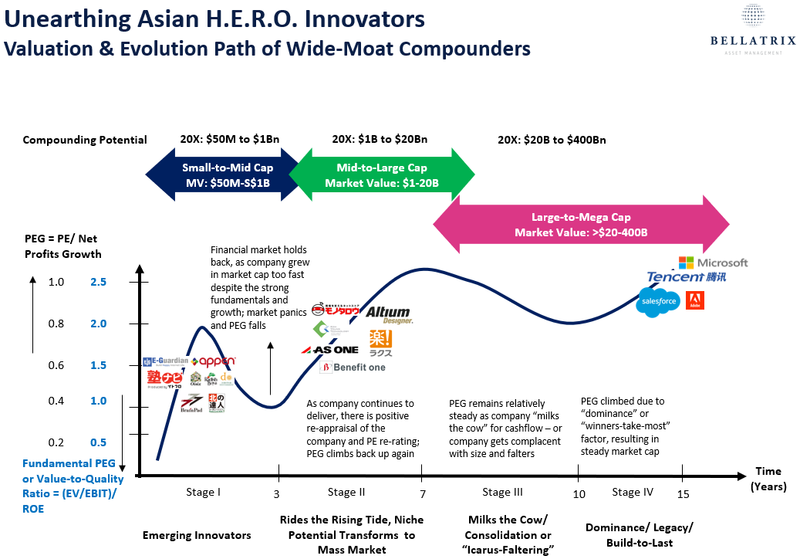 Organization.”, the inspiration behind the H.E.R.O Innovators Fund, (surprisingly) the only Asian SMID-cap tech-focused fund in the industry. The H.E.R.O. are governed by a greater purpose in their pursuit to contribute to the welfare of people and guided by an inner compass in choosing and focusing on what they are willing to struggle for and what pains they are willing to endure, in continuing to do their quiet inner innovation work, persevering day in and day out. There’s a tendency for us to think that to be a disruptive innovator or to do anything grand, you have to have a special gift, be someone called for. We think ultimately what really matters is the resolve — to want to do it, bring the future forward by throwing yourself into it, to give your life to that which you consider important. We aim to penetrate into the deeper order that whispers beneath the surface of tech innovations and to stand on the firmer ground of experience hard won through hearing and distilling the essence of the stories of our H.E.R.O. in overcoming their struggles and in understanding the origin of their quiet life of purpose, who opened their hearts to us that resilience and innovation is an art that can be learned, which can embolden all of us with more emotional courage and wisdom to go about our own value investing journey and daily life. As the only Asian SMID-cap tech-focused listed equities fund in the industry, we believe we are uniquely positioned as a distinctive and alternative investment strategy for both institutional and individual investors who seek to capture long-term investment returns created by disruptive forces and innovation without herding or crowding to invest in the highly popular megacap tech stocks, and also provide capital allocation benefit to investors in building optionality in their overall investment portfolio. The H.E.R.O. HeartWare Weekly highlights interesting tech news and listed Asian emerging tech innovators with unique and scalable wide-moat business models to keep yourself well-informed about disruptive forces and innovation, new technologies and new business models coming up, and the companies that ride on and benefit from them in some of the most promising areas of the economy in Asia as part of our thought leadership for our ARCHEA Asia HERO Innovators Fund to add value to our clients and the community. Hope you find the weekly report to be useful and insightful. Please give us your candid feedback and harshest criticisms so that we can improve further to serve you better. Besides the BATTSS (Baidu, Alibaba, Tencent, TSMC, Softbank, Samsung), do also tell us which Asian tech entrepreneurs & CEOs whom you admire and respect and why – we will endeavor to do up profiles of them for sharing with the community. Thank you very much and have a beautiful week ahead.